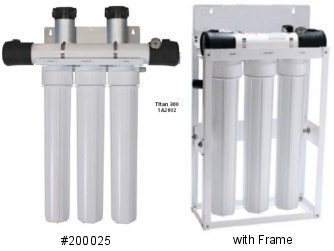 These reliable, high performance Titan Reverse Osmosis Systems are Made In The USA and are known for their computer aided design, quality components, and rugged dependable performance. Titan RO Systems are designed for higher recovery rates, minimum energy consumption, continuous commercial duty, and ease of use. Easy maintenance and operation. Titan RO Systems have all of their components strategically located for easy access and inspection. All Titans come with a built-in booster pump, and a 1 Year Manufacturer's Warranty. 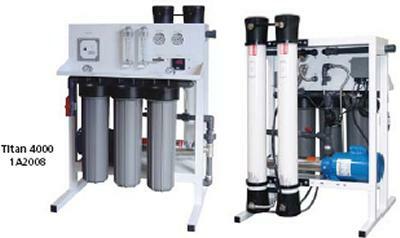 Why use Reverse Osmosis purification? Industrial customers have their important reasons why. Certain home owners will get real benefits if their water supply is nasty, objectionable. questionable, or polluted. Carbon filtration alone does not remove inorganic contamination (when present) effectively, which is where Reverse Osmosis excels. 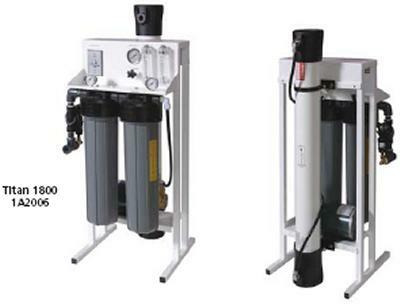 On the other hand, Reverse Osmosis is a much more "fussy" technology compared to carbon filtration, and requires that you take a close look at your water chemistry to see see if you have any water quality issues that will foul the RO Membrane. 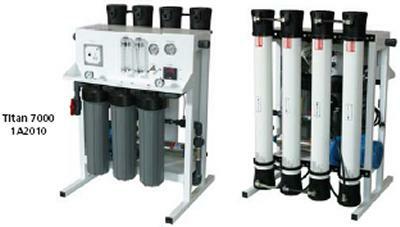 Reverse Osmosis also requires a certain amount of water pressure in order to work. Typical Setup Example: Typically you will have a Titan RO unit dumping the purified RO Water into a 500 gallon water tank (at zero pressure) while also dumping waste water down a nearby drain. The Titan Float Switch will turn off the unit when the tank gets full. A Repressurization Pump is installed just downstream of the storage tank. A UV Disinfection lamp may be installed anywhere between the Titan and the repressurization pump. Sometimes Pre-Treatment of the Raw Feed Water is required: Hard Water with a hardness higher than 15 Grains will usually need a water softener or anti-scale injection. Other water quality issues (such as Barium, Silica, Strontium, etc) may neccessitate the installation of an Anti-scale chemical injection system. High levels of Iron, Manganese, and Sulfide may necessitate the installation of an Oxidation Unit. Feed water that is not properly disinfected (well water and/or tropical customers) may end up fouling your system with bacteria and virus unless you install a UV Lamp or Chlorination system upstream. Customers who plan on processing large amounts of water may also opt to use a Backwashing Carbon unit upstream of the unit - instead of using (and replacing) the carbon block cartridges that comes with the Titan unit. See Terms of Purchase at bottom of this page. This is Professional Equipment For Professional Installation by qualified professionals. Use at your own risk. Shop responsibly. No Returns. Read all the material before purchasing. Call us with any questions.
. This is professional equipment and is only intended for professional Installation and Initial Setup. You don't want a "hack setup" on these fine systems. Get a water analysis so you can email it to us or phone it in. This is critical. Do not buy an RO system unless you have at least a Basic Water Analysis. We especially need to know about: Total Hardness, TDS, Iron, Sulfide, Manganese, pH, Chloride, Silica, Sulfate, and [Water Temperature during winter]. Barium and Strontium are also a serious problem when combined with Sulfates (SO4). Read the "Requirements Tab" above to view all the water chemistry limitations before you purchase. If you have high Chlorides and/or acidic water , plan on upgrading your Titan's pump to stainless steel. RO will typically lower your pH by 0.5-1. You may need to raise your water pH (after the RO system) to avoid leaching copper or metal pipes and faucets. Generally, you do not want acidic (pH < 6.9) RO water, especially with copper pipes. There are also health concerns about long term consumption of acidic water. There are inexpensive healthy solutions for that problem, such as a Calcite Mineral Tank, or Calcite mixed with 50% Magnesium Oxide. Certain problematic waters will need special tactics to deal with. Pre-treatment may be required. We will assist you with this if you give us your water analysis. If you have Hard Water that is too hard you will either have to install a water softener upstream of the RO system, or you may be able to install an AntiScale Chemical Injection System upstream of the RO unit. If you have too much Iron, Sulfide, or Manganese you will have to remove them with a well designed Oxidation Unit placed upstream of the RO system. Tell us how many gallons of purified water you need per day or per 8 hours. You should always add 20% to this number to account for variation and margin of error. Notice: Colder water will also produce much less gallons per day than the stated production capacity, which is based on 77 F. degree water. You need to tell us the coldest water temperature your system will experience, such as the water temperature during winter. To save electricity and reduce wear on the pumps and motors, upsize your RO system so that the pump only has to run no more than 8-12 hours per day. This saves you money on electricity and motor replacements. This is not necessary but is recommended. Basically, To only run the motors for about half the amount of time (12 hours per day vs. 24 hrs.) double the size of your RO unit. So if you you need 500 gallons per day, get at least a 1,000 GPD unit. This saves you money on electricity and motor replacements over the years. For real Continuous Duty commercial motors, choose a Titan 500 over the the Titan 200 or 300 -which are built with Intermittent Duty pumps. You also get a host of cool Options you can add to your system with a Titan 500. HOMEOWNERS: For whole house applications, each household occupant "typically" consumes about 80 gallons per person per day, on average. So 4 people will typically need about 320 gallons per day. Anticipate holidays and guests. Take into account swimming pools, hot tubs, or any additional water-consuming activities you may have. If your water is not so bad you may ask your installer to leave the garden hoses and swimming pool supply as Untreated (not RO purified). Sometimes some teenagers or some people will consume more water than the typical average of 80 GPD. 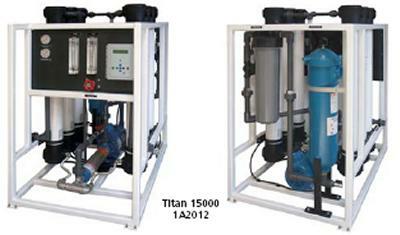 Notice: For Titan 500 or larger ALWAYS add the optional Product Flow Meter ($65.) and optional Concentrate Flow Meter ($65.) to your system! These are very important! It would be like having a car with no speedometer and no gas gauge. Do not buy a system without having these "optional" gauges added. For higher efficiencies (less waste water going down the drain) add an optional Concentrate Recirculate Feature and Recirculate Flow Meter to your system. This will typically boost your efficiency (less waste water) by around 20-40% or so, but will also make your waste water more concentrated with whatever was in your water to begin with. This will increase the "workload and stress " on your RO membrane. Do not add a Recirculate unless you actually have a need for it. We can upgrade your PVC Membrane Housings to Fiberglass or Stainless Steel if you wish..
Generally, most applications involve the purified water slowly filling a [zero pressure] open Atmospheric Storage Tank (200-500 gallons or larger). Atmospheric Storage Tanks have no pressure, and require a 1" Bulkhead Fitting at the bottom so you can hook up a suitable Repressurization Pump which you will almost always need. Atmospheric Storage Tanks also require you to add a Titan Float Switch (#200918 - $75.) to automatically shut off the RO system when the water tank gets full. Without this, "catastrophic flooding" will occur. The electrical wire on this is about 20 feet long, and requires a nearby electrical outlet. The engineers generally recommend an Atmospheric Storage Tank (at zero pressure) vs. a Pressure Tank. This will put no 'back pressure" on the RO Membrane, which will give you less waste water going down the drain. You may add a UV Disinfection System between the water tank and the re-pressurization pump. This must be properly sized to meet or exceed the flow rate of the Re-pressurization Pump. .Pressure Tanks are another option. They are totally sealed and do not allow any air, microbes, or impurities to get into the water. They are much smaller, empty faster, and do cost more. 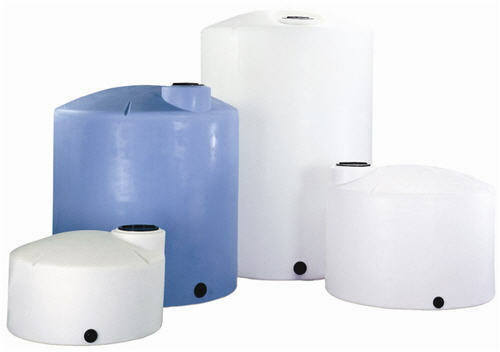 We generally recommend the Fiberglass wrapped (polyethylene interior) pressure tanks for RO water, especially for laboratory applications. Metal tanks are usually coated with an epoxy lining. 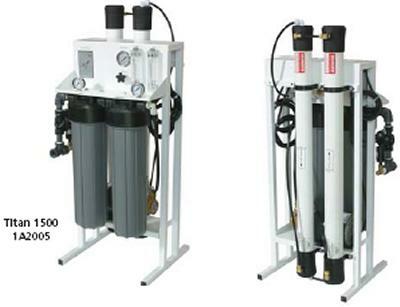 Using a Pressure Tank will usually require you to purchase a larger sized RO system to keep up with your flow requirements, while a much much larger Atmospheric Storage Tank will allow you to buy a smaller RO system. Pressure Tanks require you to add a High Pressure Switch to your RO system. A High Pressure Switch automatically starts the RO system when the tank pressure falls below 40 PSI and stops the system when the tank pressure reaches 60 PSI. .RO systems generally put out a fairly low water pressure of about 40 PSI. Repressurization of the purified water supply may still be necessary. 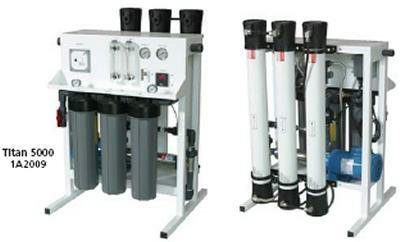 All RO systems generate a Wastewater that will have concentrated levels of whatever was in your water to begin with. This will need to be directed to an appropriate drain. Remember that your waste water will typically be about 2-5 times more volume than the purified water you produce each day! This is how RO technology carries away the contaminants from the membrane and keeps it clean. Notice: Pre-Treatment May Be Required. Generates 300 GPD of RO Water only if left running for 24 hours. We do not recommend running for any longer than 12-16 hours per day due to the intermittent duty pumps. You can choose between a wall-mounted standard model or a model with a steel frame. Features 2.5"x20" Housings and Cartridges. Can be hooked up to a pressure tank or open atmospheric storage tank of any size. Intermittent Duty Pressure Boosting Pumps are included. Do not run these pumps any more than about 12 hours per day or you will have to replace them sooner than normal. Connections: Feed: 3/8" Product: 3/8" Waste: 1/4"
Titan 300 Product Sheet - View PDF file for all the detailed standard features, operating specs, system specs, and available options. with 20" Housings only $895. Titan Float Switch for Atmospheric Tanks (#200918) $75. Shuts off the Titan when your water tank is full. Dual Inline TDS Monitor DM-2 (#200881) $60. Uses (2) 2521 HF1 (150 PSI) Membranes (polyamide) rated for a typical Salt Rejection of 98.5 %. Typically replace every 3-5 years. Titan 500 Product Sheet - View PDF file for all the detailed standard features, operating specs, system specs, and available options. Titan Float Switch for Atmospheric Tanks only (#200918) $75. Shuts off the Titan when your atmospheric water tank is full. High Pressure Switch for Pressure Tanks only (on at 40 PSI/off at 60 PSI) #200055 $75. Install HM Digital Panel Mount Dual TDS Meter PS-200 (#200053) $300. Hand Held Digital Pocket TDS Meter, (basic ppm version) $ 33. Upgrade Brass Rotary Vane Pump to Stainless Steel Rotary Vane Pump (especially for low pH and high chlorides) (#200060) $115. Replacement Standard HF1 ( Low Energy-150 PSI) RO Membranes, Uses (2) 2521 HF1 RO Membranes (#200375) @ $110. each. (Replace typically every 3-4 years.) 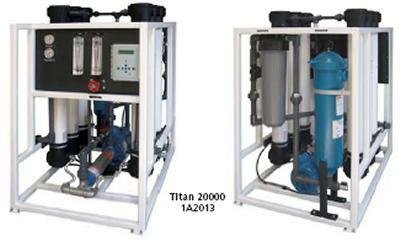 Notice: Based on your water chemistry, we may ship you a Titan wth upgraded membranes. Refer to your receipt. Uses (3) 2521 HF1 (150 PSI) Membranes (polyamide) rated for a typical Salt Rejection of 98.5 %. Typically replace every 3-4 years. Titan 1000 Product Sheet - View PDF file for all the detailed standard features, operating specs, system specs, and available options. Install HM Digital Panel Mount Dual TDS Meter PS-200 (#200053) $303. Upgrade Brass Rotary Vane Pump to Stainless Steel Rotary Vane Pump (especially for low pH and high chlorides) (#200060) $113. 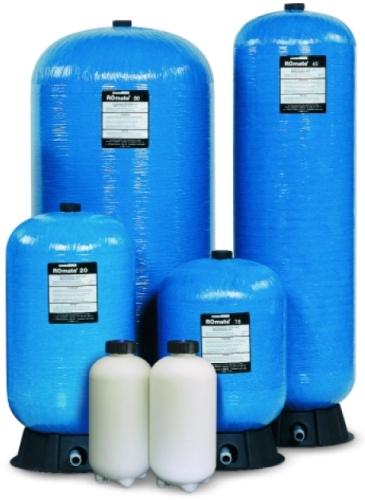 Replacement [Standard] HF1 (High Flow Low Energy-150 PSI) RO Membranes, Uses (3) TFC 2521 HF1 RO Membranes (#200375) @ $115. each. (Replace typically every 3-5 years.) Notice: Based on your water chemistry, we may ship you a Titan will upgraded membranes. Refer to your receipt. Uses (2) 2540 HF1 membranes @ $155. each. Replace every 3-5 years. Titan 1500 Product Sheet - View PDF file for all the detailed standard features, operating specs, system specs, and available options. Replacement [Standard] HF1 (High Flow Low Energy-150 PSI) RO Membranes, Uses (2) 2540 HF1 RO Membranes (#200376) @ $175. each. (Replace typically every 3-4 years.) Notice: Based on your water chemistry, we may ship you a Titan will upgraded membranes. Refer to your receipt before ordering. Uses (1) 4040 HF1 membrane @ $275. each. Replace every 3-4 years. Titan 1800 Product Sheet - View PDF file for all the detailed standard features, operating specs, system specs, and available options. Uses (3) 2540 HF1 membranes @ $205. each. Replace every 3-4 years. Titan 2500 Product Sheet - View PDF file for all the detailed standard features, operating specs, system specs, and available options. Uses (2) 4040 HF1 membranes @ $275. each. Replace every 3-4 years. Connections: Feed: 3/4" Product: 1" Waste: 1"
Titan 4000 Product Sheet - View PDF file for all the detailed standard features, operating specs, system specs, and available options. Uses (3) 4040 HF1 membranes @ $275. each. Replace every 3-4 years. Titan 5000 Product Sheet - View PDF file for all the detailed standard features, operating specs, system specs, and available options. Uses (4) 4040 HF1 membranes @ $275. each. Replace every 3-4 years. Titan 7000 Product Sheet - View PDF file for all the detailed standard features, operating specs, system specs, and available options. Uses (6) 4040 HF1 membranes @ $275. each. Replace every 3-4 years. Price: $ (Call 210-568-3628 for pricing). 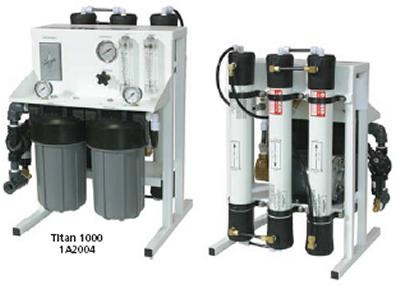 Titan 10000 Product Sheet - View PDF file for all the detailed standard features, operating specs, system specs, and available options. Uses (8) 4040 HF1 membranes @ $275. each. Replace every 3-4 years. Connections: Feed: 2" Product: 1" Waste: 1"
Titan 15000 Product Sheet - View PDF file for all the detailed standard features, operating specs, system specs, and available options. Uses (10) 4040 HF1 membranes @ $255. each. Replace every 3-5 years. 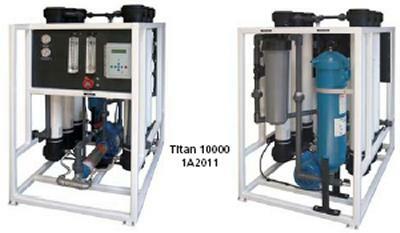 View pdf file of Titan 20000 Product Sheet for all the detailed standard features, specs, and options! Titan 20000 Product Sheet - View PDF file for all the detailed standard features, operating specs, system specs, and available options. Call us for LARGER SYSTEMS! To get the full production capacity of your RO System, you can have it dump the RO purified water into a (no pressure) Atmospheric Storage Tank. To do this, select a tank gallon capacity that equals your RO system's maximum output in Gallons Per Day. We only feature the premium grade of tank made of thicker polyethylene for drinking water applications. To prevent algae growth, request the color Black. Maximum Operating Pressure and Temperature: 125 PSI, 120 F.
This is a Pressure Bladder Tank. Requires you to add a High Pressure Switch to your RO system. High Pressure Switch automatically starts the system when the tank pressure falls below 40 PSI and stops when the tank pressure reaches 60 PSI. RO Mate 20 Gal Fiberglass (holds about 10 gal.) Approx. Dimensions: 16"x33" Connection is 1" male NPT. RO Mate 30 Gal Fiberglass (holds about 15 gal.) Approx. Dimensions: 16"x44" Connection is 1" male NPT. RO Mate 40 Gal Fiberglass (holds about 20 gal.) Approx. Dimensions: 16"x58" Connection is 1" male NPT. RO Mate 80 Gal Fiberglass (holds about 40 gal.) Approx. Dimensions: 24"x57" Connection is 1.25" male NPT. This is professional equipment and is intended for professional installation only. Purchaser and/or End User is responsible for procuring a qualified installation professional or Water Treatment Specialist who is familiar with commercial RO systems. Your installation professional should instruct you on how to properly operate, monitor, and maintain the system. Your installer is who you call in the event of a problem. Notice: Technical support from the factory is only available for licensed professional installers, not consumers. Failure to hire and document your "qualified professional installer" may potentially have a negative effect on your Manufacturer's Warranty. We don't recommend it. 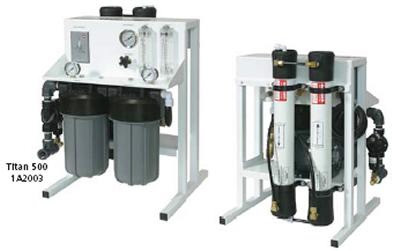 Proper performance of this equipment is dependent upon your water quality, the information you give us, proper setup and adjustment of the system, and proper operation according to the owner's manual. Please consult the "System Operating Specifications" on the product sheet before purchasing. Contact us if you cannot find it. Your water quality and water supply must meet those conditions in order for your system to function properly. We are not responsible if your water quality does not meet those conditions. 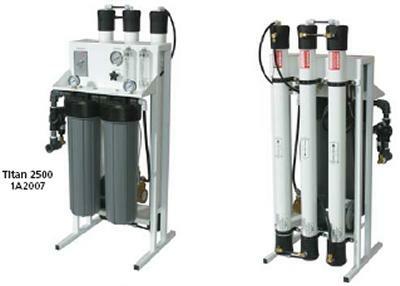 All RO systems produce a "waste concentrate water" that needs to be disposed of properly. Prices are subject to change without notice. We reserve the right to change incorrectly priced items and typos. Manufacturers are constantly increasing their prices in this economy. Returns are only accepted solely at the discretion of the Manufacturer under the Manufacturers 1 Year Limited Warranty against defects. We cannot accept returns on these products. Do not buy unless you really want it. No Returns. All shipping fees are non-refundable. We are not responsible for any delays caused by the manufacturer or the shipping company. We are not responsible for any damages incidental or consequential caused by any delays in Lead Time or Delivery or goods arriving as damaged or missing parts. Purchaser is responsible for verifying that the Delivery Address is correct on their receipt. All shipping fees are non-refundable. We are not responsible for any "expedited" shipping fees you may request if a part is missing or damaged. Products are shipped with insurance, and all delivery damage claims are between the purchaser and the delivery insurance. Products should be inspected for damage immediately upon delivery and shipment should be Refused Due To Damage before the driver leaves if damage is found. Call us immediately for assistance and take a digital photo for the insurance inspector. We will greatly assist you with your insurance claim but we are not liable for the damage, the delay, or the consequences of the delay. For all of these products determination of product suitability, the application use of the product, and the fitness of a product for a particular purpose is the sole responsibility of the buyer. We make no warranty, express or implied, of merchantability or of fitness for a particular end use. We are not liable for any damages you may may incur, incidental or consequential, from the use or failure of these products. Buy and Use at your own risk. No promises and guarantees are made or implied that these products will perform well on your particular application. We are not liable or responsible if a product does not perform to your satisfaction. All information provided to you by us is made in good faith and is believed to be correct. All information is provided for your careful evaluation and review, and we are not responsible for any errors or omissions, or the consequences of any errors or omissions. All pumps make some degree of noise. Sometimes this needs to be taken into consideration when choosing your installation location. If you are using this equipment to treat known (or unknown) contaminants, the Purchaser and/or End User if solely responsible for obtaining lab analysis of the purified product water to assertain that the system is removing that contaminant to levels deemed safe. Periodic monitoring through lab analysis is also required. Consult with a Licensed Water Treatment Specialist in your area if you are treating water that is chemically or biologically unsafe or contains contaminants at levels that exceed the federal and state drinking water standards.